But a lesser-known item at Sears was the prefabricated single-family home, mass-produced in a U.S. manufacturing facility by Sears, Roebuck and Co. More than 100,000 of these homes were sold between 1908 and 1940, shipped in kits throughout the United States and Canada for on-site assembly. Priced at less than $2,500, these kits contained some 30,000 pieces, including lumber, nails, paint and shingles, plus an instruction book, similar to a child’s Lego set. Owners could hire someone to build the home or do it themselves, often convincing friends and family to provide sweat equity. That early innovation is now back in style. In a bid to improve current housing affordability challenges and combat rising land and construction costs, many cities are returning to prefabricated or modular construction. Prefab is now featured in everything from single-family homes and seniors’ complexes to six-storey hotels and 25-storey apartment buildings. These homes are currently being designed for B.C.’s Kitimat LNG employees. 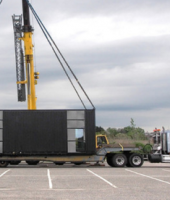 One of our UDI members, Stack Modular, specializes in this cost-effective construction method for multi-family housing, hotels, and student residences. The operations manager, Matt Hallaran, recently described the benefits to almost 200 interested builders at our November educational seminar. The major advantage of prefab housing is that manufacturers can build within a large, climate-controlled indoor factory, at a much faster rate, while demolition, excavation and foundations are concurrently completed on the actual site. A six-storey hotel can be built on the factory floor in three months and assembled on site in about 20 days, allowing three to four months of additional finishing work for mechanical, electrical and plumbing work. Compare that to an approximately 24-month conventional construction timeframe for a similar project. Construction disruption to the surrounding neighbourhood is also significantly reduced. Depending on the project complexity, shipping destination and other factors, a builder can save up to 50 per cent on construction time and about 20 per cent on the cost of traditional construction, due to a shorter financing period. 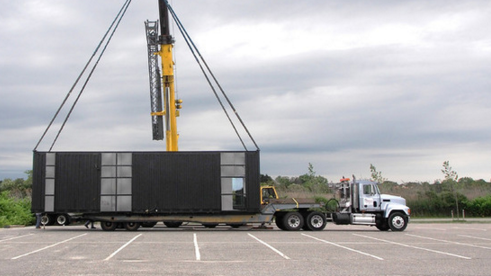 Contrary to some assumptions, a modular building is not a basic, cookie-cutter box. Prefab homes are incorporating modern and pleasing architectural elements plus customized, eco-friendly and smart home technology by design. People won’t even know they’re modular. Some B.C. communities have already welcomed modular housing, approving projects for the homeless in as little as six weeks. But, unlike our European or American counterparts, Canada has been slow to adopt this construction method for urban developments. One of the world’s larger hotel chains, Marriott, recently opened a modular hotel with 97 rooms, called the Folsom Fairfield Inn & Suites, in California, with plans for more. A 32-storey skyscraper was recently completed in New York with similar highrise modular buildings to follow. Even the Swedish company IKEA is selling pre-fabricated homes called BoKlok. In the last 20 years, IKEA has sold more than 11,000 modern prefab homes to European clients. They cost 40 per cent less than their traditionally built counterparts and are ready in eight to 12 months. Meanwhile in Asia, the Financial Times reports that prefabricated homes comprised 16 per cent of Japan’s housing built in 2015. The Malaysian government went further, dictating 70 per cent of all construction should be prefabricated. For British Columbia, where people are struggling to afford a good home in many communities, these prefabricated homes represent a smart living solution. With straightforward designs and high-volume manufacturing, they can help lower costs while maintaining high-quality standards.